This weekend provided one of those many occasions where simply being in the right place at the right time allowed me to experience something that I’d never planned for or was even aware of until days before the event. 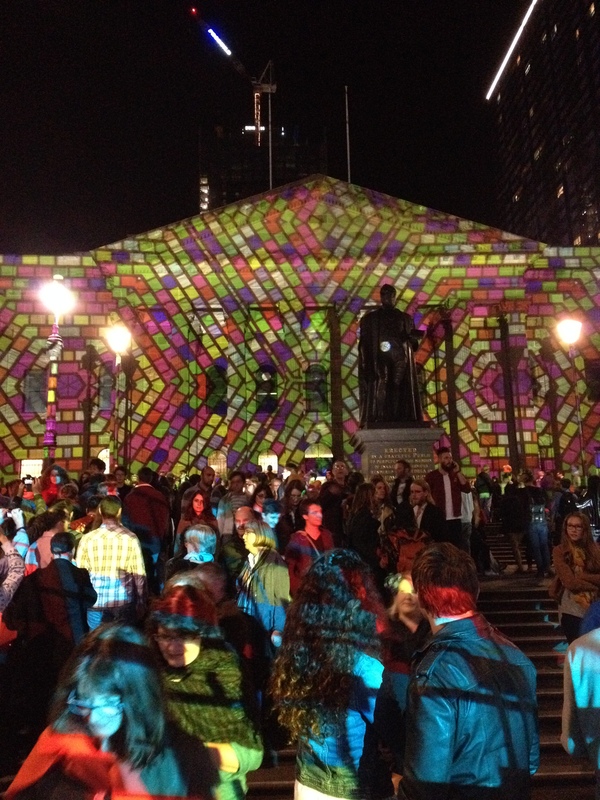 Last year, Melbourne hosted it’s very first White Night festival drawing over 300,000 people in to the city centre. This year, the city had prepared to receive closer to half a million people. 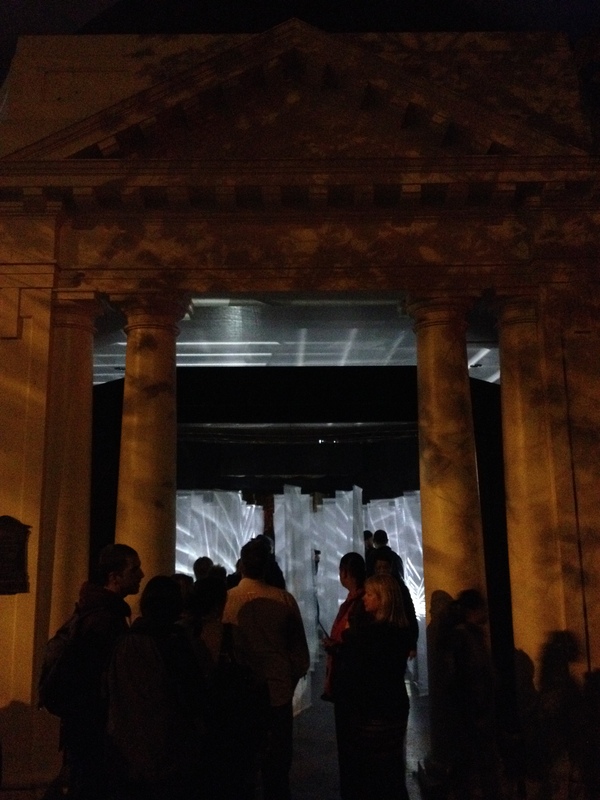 Projectors, lights, and scaffolding started popping up around the city early last week. The city closed to traffic late Saturday evening and people started arriving in droves. 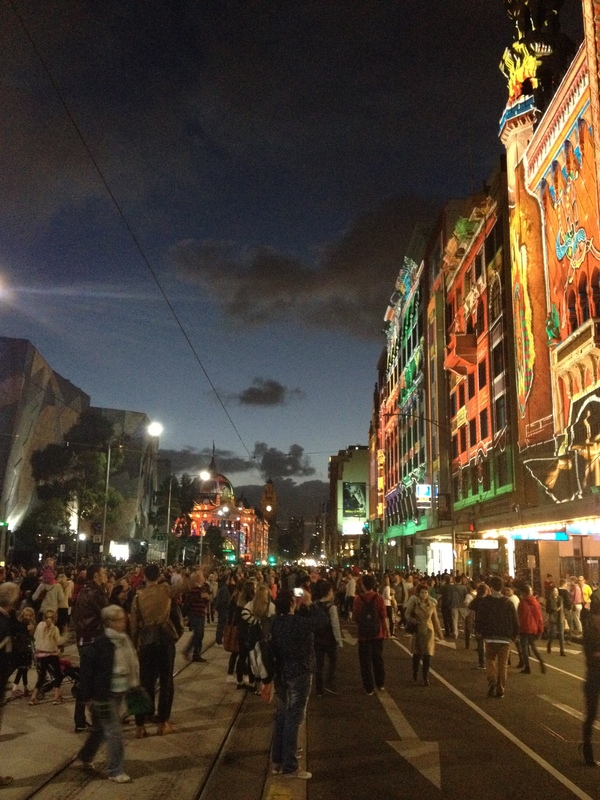 White Night is a celebration of arts and culture that occurs across twelve hours, from dusk ’til dawn. How very Melbourne. 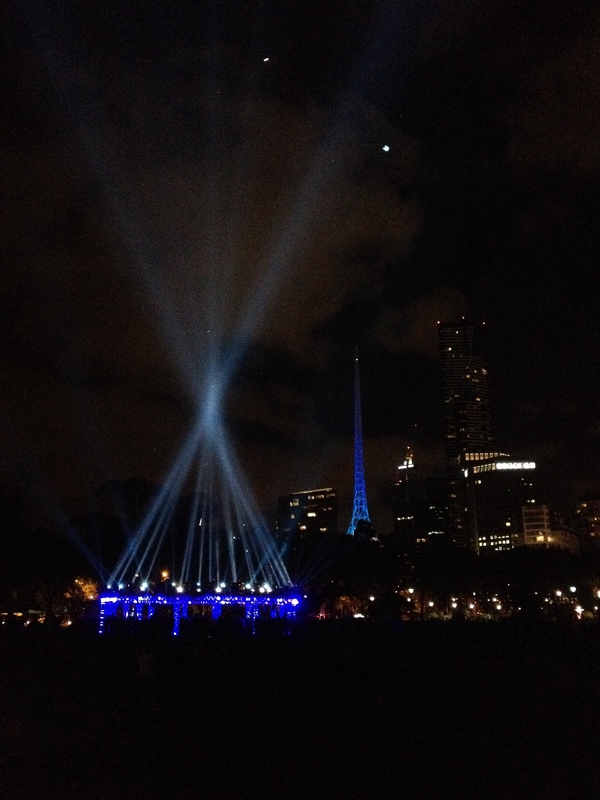 As the self-proclaimed Australian capital of culture, it seemed particularly apt for the city to host such an event. I headed into the city just before things kicked off, meeting up with my friends Tamsin and Jag to check out everything that was happening. We began at Flinders Street where, based on pictures from last year and word of mouth, we waited with hundreds of others for the night to begin. 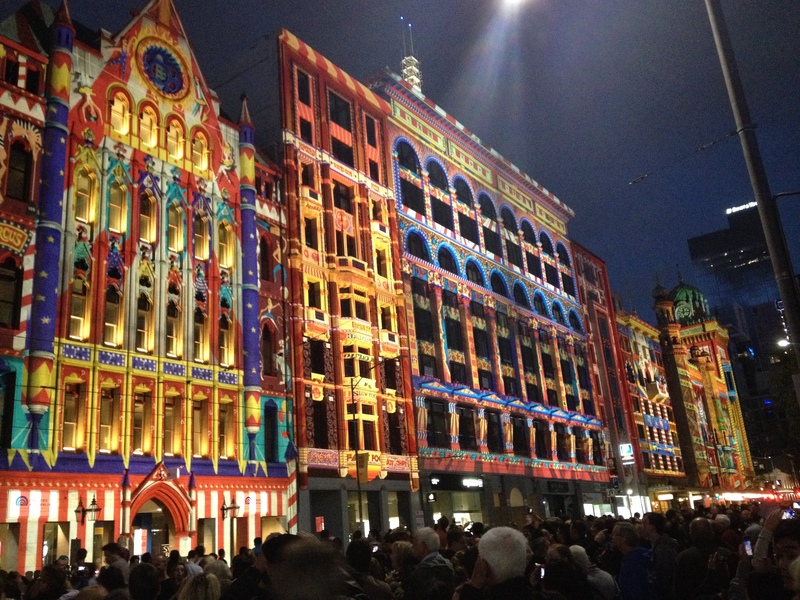 The buildings along Flinders Street and Flinders Street Station itself became the screens for projections that completely changed the appearance of the city. When you see pictures and hear about how great it is, you imagine something to be pretty good but the projections were awesome. 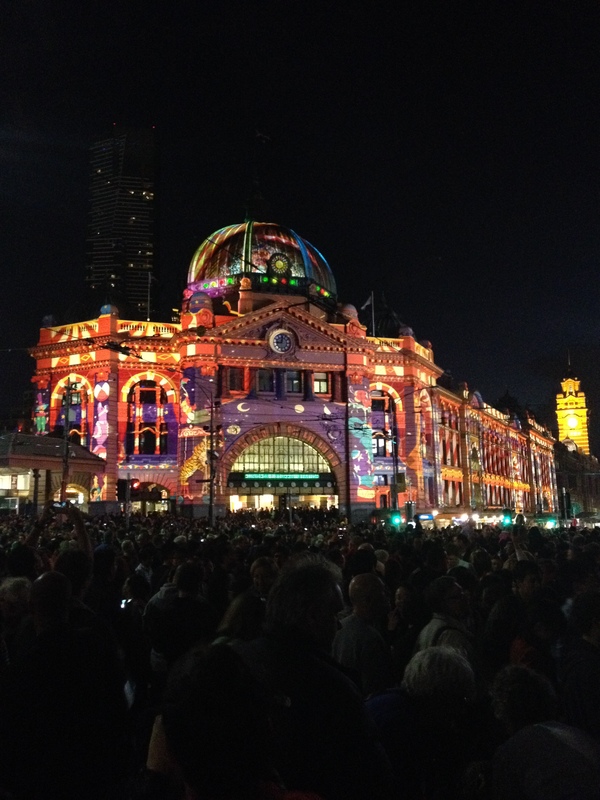 It was quite incredible to see the usually yellow Flinders Street Station looking red, green and blue depending on the theme. The night began on a high, with all three of us feeling pretty impressed with the way things had kicked off and got a little excited about what other displays, events and attractions Melbourne had to share with us. 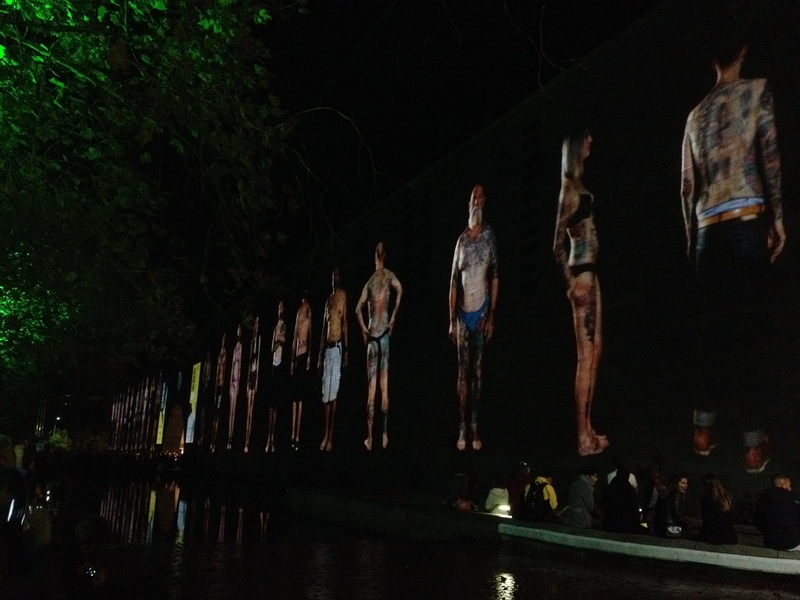 We decided to the head down to the NGV which was also the canvas for another projection; Tattooed City. In this, people of Melbourne with tattoos were filmed and photographed and thrown up on the walls of the gallery. It was kind of cool ad the subjects involved all looked incredibly self-conscious, which if they knew what was going to happen with the footage is of little surprise. By now, we’d decided that we’d better put a sort-of-plan together in order to see as much as possible and headed into Alexandra Gardens for the next installations. Wandering past short films, illuminated trees and colour changing lights we came across Julio Le Parc’s Lumières En Vibration; a combination of bouncing lights, mirrors and translucent fabric coming together to form an impressive mirror maze within the Janet Lady Clarke Rotunda. I struggled with mirror mazes as a child. I remember coming out of one at a carnival with a huge red lump on my forehead from where I had constantly bumped into the plastic walls. I managed to avoid a similar fate here, but I did catch myself just short of walking face first into a mirror. Upon exiting, we headed down to the river, passed some metallic spheres to what I think may have been the highlight of the night; Monuments. 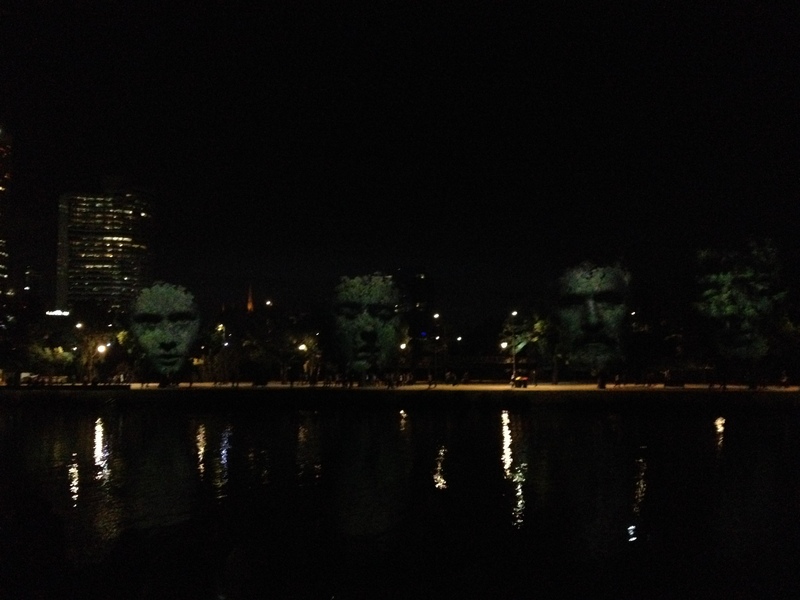 Those are faces, projected on to trees. The faces were mostly asleep, but every so often they’d stir and come awake for a period of time and it was, quite frankly, a little bit creepy to have a tree staring at you with a human face. I think we were all in agreement that this was the best thing we’d seen so far before heading on to check out the huge set up of spotlights that were tracking clouds, or fixed in shape over a large ring of blue and purple lights that was also thundering out droning, beeps and whirs. There were a lot of people lying down under the structure, and I suspect many of them may have spent large chunks of their evenings watching the lights float across the sky, highlighting birds, clouds and the bigger moths and other insects that were attracted to the bright lights. It was one of those classic simple and effective installations that could lead you on your merry way to thoughts of a science fiction nature. The droning eventually became too much and we decided it was high time to head back into the city to see some of the other areas. Other attractions included a pyramid of sand with a rotating, colour changing projection and yet more droning. 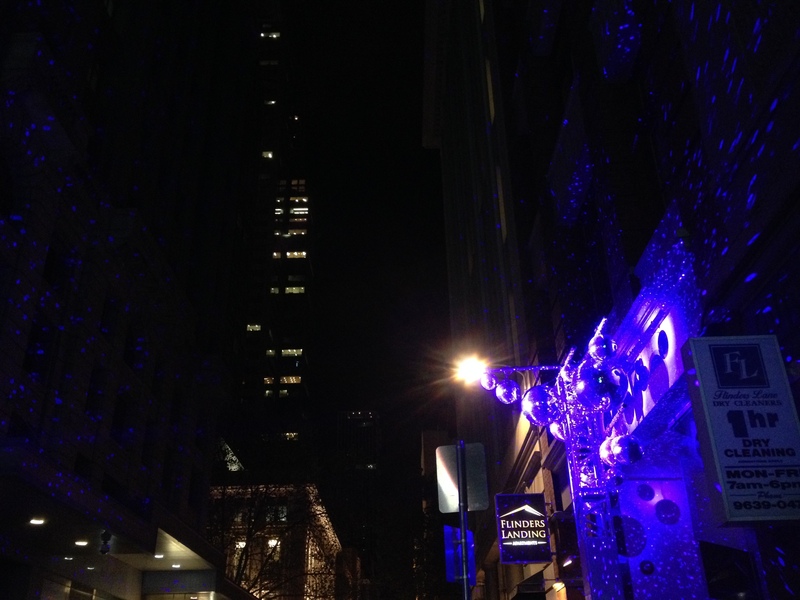 A disco-ball arrangement lighting up half a block. Slowly, we began to realise things were taking a turn for the worse, but we were heading to the north of the CBD were the installations had actually been generating some hype. Inside the State Library and the Old Melbourne Gaol were supposedly home to some of the events most impressive attractions, so we started heading up towards them. The library looked a little funky from the outside and there was our first serious queue to get in. 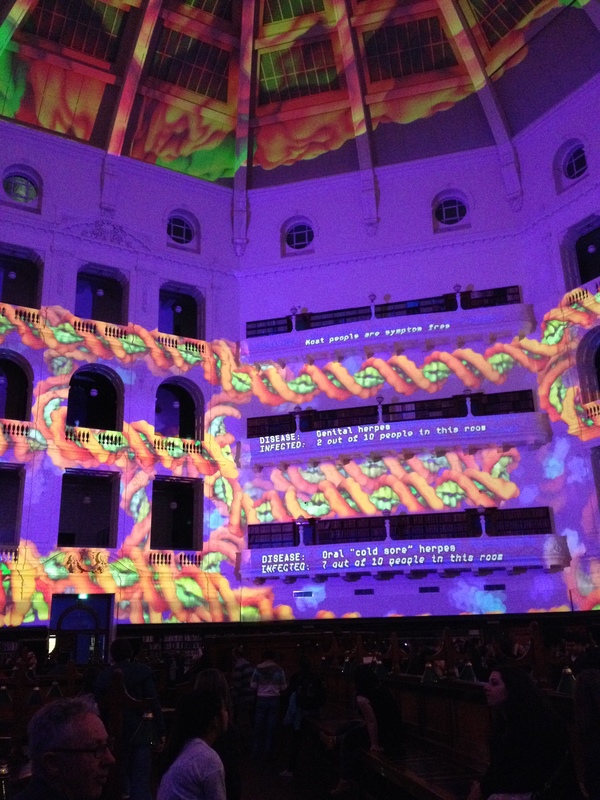 With all the hype surrouding the projections inside the La Trobe reading room, we all decided it’d be worth jumping in line and as it was moving fairly quickly we didn’t feel like we were wasting any time. Once inside, I’d started to feel a little disappointed with the word of mouth. An ever changing fuzzy microbe of a disease, wiggly lines and brief facts about the disease projected on the walls and dome were what we had waited for. I suddenly found myself agreeing with condemners of modern, conceptual art. Maybe it was the hype, perhaps I was expecting more because other people had spoken highly of it. Maybe it’s because I’m not a microbiologist and have little interest in seeing a disease blown up to a million times it’s original size. Our expectations for the final installation we’d hoped to see had dipped a little as well. 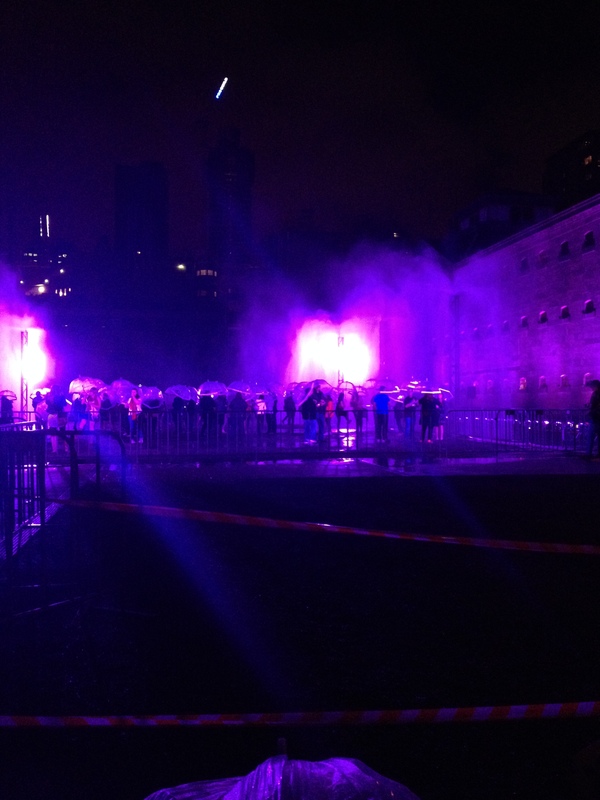 Purple Rain was perhaps the attraction I’d heard most mentioned through the crowds and as we found the longest queue around the old gaol, I became very skeptical as to what we were waiting for. Leaving Tamsin and Jag in line, I went on ahead to see if I could see that we were in the right queue and for any glimpses of what we were waiting for. At the front of the queue I found disappointment once more. Purple lights, water sprinklers and Prince’s Purple Rain playing over it all. This was what people were waiting ten or twenty minutes for? It struck me as one of those occasions where people had to be seen to be doing. If you hadn’t seen Purple Rain, how could you justify how cool you were to your friends who would almost definitely have seen it? Better tell everyone you think it was cool, even though you probably weren’t all that impressed. The hype in this case, as far as I’m concerned, was without justification. Or maybe not, maybe I just don’t get it. I led Tamsin and Jag out of the queue, to look through at what we would have been waiting for and they agreed that we should probably go and look at Flinders Street again because it’d be crazy to end a good night on such an underwhelming note. 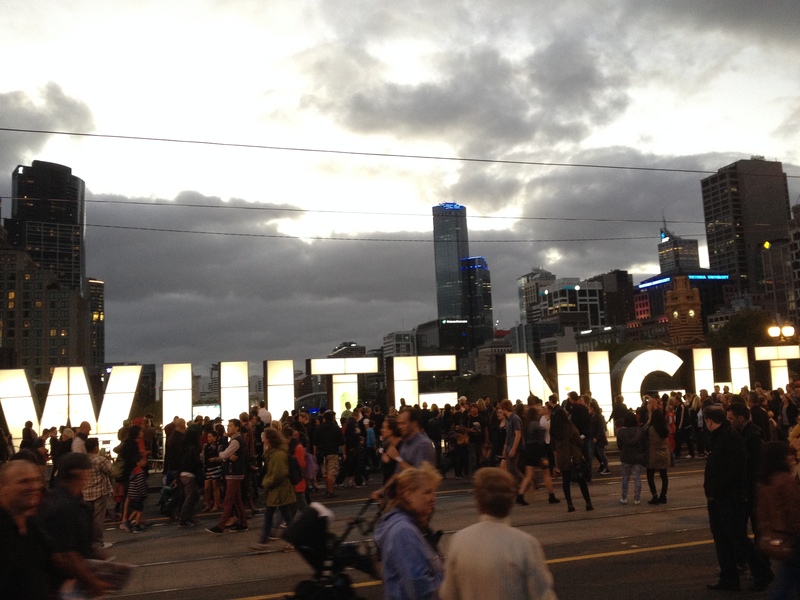 White Night is a good night and there is more than enough to keep everyone happy and entertained. You could easily find something you liked and just watch if for hours as the night passes you by. You just have to be careful, make your own decisions and see what you want to see and not what everyone else is talking about. This one of the coolest (and most sleep deprived) nights I had while in Melbourne, it’s awesome to see other people’s perspectives of it! Thanks a lot! It was a great night, hope I get to experience it again sometime.